Volvo S60 Pros and Cons | Page 1 of 2 | Why Not This Car? What drives people to buy (or not buy) a certain car? TrueDelta's members share Volvo S60 pros and cons based on their real-world driving experiences. If on a budget and want: comfort, decent performance, styling and safety look absolutely no further. Average mpg from trip computer is 30.1! Can't complain. Mostly driven as a commuter car on relatively flat 2 lane roads at 55 mph. 2013 Volvo S60 T6 AWD - Excellent car, tremendous value. Very happy. My wife wanted a Volvo for our family because of there reputation for safety and reliability. While fortunately i cannot speak to its safety, it has been nothing but a unreliable money pit. If you don't need alot of rear seat or trunk room and want something in the entry luxury level that is fun to drive but different than BMW, Audi, Lexus, etc. give this a look. Have owned for 4.5 years. Wife and I purchased based on experiences of 2 family members who had good experiences. We have been stranded once (in driveway) due to faulty shift lock mechanism, otherwise have put 151,000 essentially pain-free KM on this. 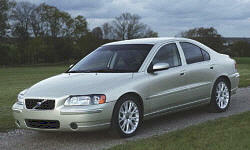 My Volve S60 handles beautifully and is very responsive in different driving situations. I have heard this car described as a WRX with a suit and tie. The car boasts masculine lines and features. A head-turner, people know this isn't your average sedan, ricer, or Volvo. Exterior says luxury and brute all in one package. Imposing, it makes the car look solid. This is my first Volvo, so the safety and braking aspect is purely based on reputation however I like the fact my car comes with front/rear Brembo. If an average sized driver has the front seats in a comfortable position, children in the back still have their legs nearly pinned against the back of the seats in front of them. The seats theselves are very comfortable, though. The steering felt extremely heavy, and did not become more engaging at freeway speeds. I can adjust the suspension from Comfort to Sport to Advanced. No need to change shocks, springs. S60R has a 5 cyl turbo charged engine producing 300 hp and 295 torque. Great performance for this size car, and in a very unassuming form - Volvo. AWD is fantastic after it breaks and is fixed, and the handling/suspension is adjustable and fun. Unique styling, not typical cookie cutter style so common with pacific rim cars. Distinctive styling, you do not see one on every corner like you do a BMW. timeless, never looks dull. fits in everwere.